According to the Social Security Administration (SSA), almost 9 of 10 people aged 65 or older receive Social Security benefits. However, most retirees also rely on other sources of income. 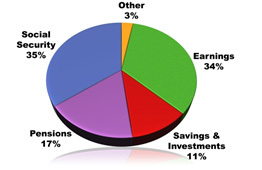 For a rough estimate of the annual benefit to which you would be entitled at various retirement ages, you can use the calculator on the Social Security website, http://www.ssa.gov/ Your Social Security retirement benefit is calculated using a formula that takes into account your 35 highest earnings years. How much you receive ultimately depends on a number of factors, including when you start taking benefits. You can begin doing so as early as age 62. However, your benefit may be 20% to 30% less than if you waited until full retirement age (65 to 67, depending on the year you were born). Benefits increase each year that you delay taking benefits until you reach age 70. As you're planning, remember that the question of how Social Security will meet its long-term obligations to both baby boomers and later generations has become a hot topic of discussion. Concerns about the system's solvency indicate that there's likely to be a change in how those benefits are funded, administered, and/or taxed over the next 20 or 30 years. That may introduce additional uncertainty about Social Security's role as part of your overall long-term retirement income picture, and put additional emphasis on other potential income sources. If you are entitled to receive a traditional pension, you're lucky; fewer Americans are covered by them every year. Be aware that even if you expect pension payments, many companies are changing their plan provisions. Ask your employer if your pension will increase with inflation, and if so, how that increase is calculated. Your pension will most likely be offered as either a single or a joint and survivor annuity. A single annuity provides benefits until the worker's death; a joint and survivor annuity provides reduced benefits that last until the survivor's death. The law requires married couples to take a joint and survivor annuity unless the spouse signs away those rights. Consider rejecting it only if the surviving spouse will have income that equals at least 75% of the current joint income. Be sure to fully plan your retirement budget before you make this decision. Many retirees plan to work for at least a while in their retirement years at part-time work, a fulfilling second career, or consulting or freelance assignments. Obviously, while you're continuing to earn, you'll rely less on your savings, leaving more to accumulate for the future. Work also may provide access to affordable health care. Be aware that if you're receiving Social Security benefits before you reach your full retirement age, earned income may affect the amount of your benefit payments until you do reach full retirement age. If you're covered by a pension plan, you may be able to retire, then seek work elsewhere. This way, you might be able to receive both your new salary and your pension benefit from your previous employer at the same time. Also, some employers have begun to offer phased retirement programs, which allow you to receive all or part of your pension benefit once you've reached retirement age, while you continue to work part-time for the same employer. How much you can afford to withdraw each year without exhausting your nest egg. You'll need to take into account not only your projected expenses and other income sources, but also your asset allocation, your life expectancy, and whether you expect to use both principal and income, or income alone. How you'll deal with required minimum distributions (RMDs) from certain tax-advantaged accounts. After age 70½, if you withdraw less than your RMD, you'll pay a penalty tax equal to 50% of the amount you failed to withdraw. One widely cited study by economists John Havens and Paul Schervish forecasts that by 2052, at least $41 trillion will have been transferred from World War II's Greatest Generation to their descendants. (Source: "Why the $41 Trillion Wealth Transfer Is Still Valid.") An inheritance, whether anticipated or in hand, brings special challenges. If a potential inheritance has an impact on your anticipated retirement income, you might be able to help your parents investigate estate planning tools that can minimize the impact of taxes on their estate. Your retirement income also may be affected by whether you hope to leave an inheritance for your loved ones. If you do, you may benefit from specialized financial planning advice that can integrate your income needs with a future bequest. If you're hoping to convert an existing business into retirement income, you may benefit from careful financial planning to minimize the tax impact of a sale. Also, if you have partners, you'll likely need to make sure you have a buy-sell agreement that specifies what will happen to the business when you retire and how you'll be compensated for your interest. According to the Social Security Administration, more than 70% of Americans choose to take early Social Security benefits rather than wait until full retirement age.